Put the flour into a mixing bowl. Make a well in the center of the flour and add the egg. While whisking, pour in the nondairy creamer and then the skim milk. Continue to whisk until the batter is smooth and free of lumps, then whisk in the nutmeg and vanilla. Cover the batter and set it aside for 30 minutes. Preheat an 8-inch nonstick crepe pan or a small, heavy nonstick frying pan for about 1 minute over medium-high heat. Spray it twice with the vegetable oil. Spoon just enough batter into the pan to form a thin layer over the bottom, about 3 tablespoons, and tilt the pan to spread the batter evenly. Cook the crepe for 1 to 2 minutes, just until the edge is firm and begins to separate from the bottom. Flip the crepe with a spatula and cook for 1 to 2 minutes more on the other side, until golden brown. Remove the crepe to a sheet of waxed paper. Continue the process, stacking the cooked crepes on the waxed paper, until 8 crepes have been made. For the filling, combine the orange juice, liqueur, peaches and honey in a medium frying pan. Cook for about 10 minutes until the liquid turns thick and syrupy. To assemble, lay a crepe on an individual serving plate. Mound 1/3 cup of the peach slices on the bottom half of each and flip the top half over. Spoon a tablespoon of the peach syrup over each and dust with cinnamon, orange zest and powdered sugar if desired. 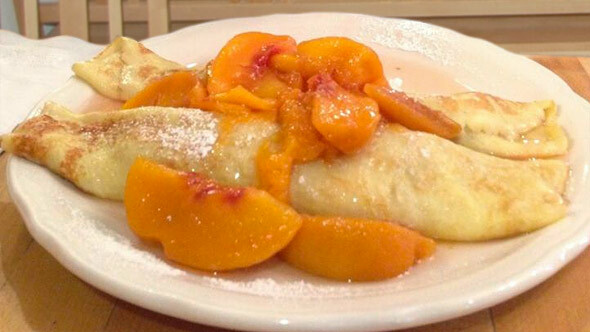 A basic crepe infused with Amaretto flavor is filled with a warm, peach filling infused with orange juice and orange liqueur. A must-try when peaches are at their peak. Mr Breakfast would like to thank tamokoroko for this recipe. Recipe number 474. Submitted 9/13/2002.